Currently there is a controversial domestic issue in Germany, which nobody seems to notice during the international refugee crisis and the depression in Greek. It deals with the distribution of the tax revenues among the German federal states, the so-called Länder. In the German institutional framework equal living conditions in the whole country are guaranteed by its constitution. Therefore the tax revenues among the Länder are aligned by a complex distribution system, which consists of four stages. and, in 2014, around 2% of VAT go to the municipalities. At the second stage, the Länder-share of the joint taxes are distributed. Apart from VAT, the Länder are entitled to the tax revenue which is collected on their territory (principle of local revenue). 75% of VAT is distributed according to the number of inhabitants in the Länder. The rest of the Länder-share of VAT is meant for those federal states, whose tax revenues per capita are lower than the per capita average of all the Länder (see the red line in Figure 1). The amount of the VAT portions depends on the amount by which the per capita tax revenue of a Land falls below the average. Because this step ignores the principle of local revenue and already causes an equalising adjustment before the true equalisation mechanism begins, it is heavely criticized by Länder with high VAT revenues. For example North Rhine-Westphalia is worse off after stage 2 (Figure 2), even though it was not better than the average before (Figure 1). The starting point for the real equalisation mechanism among the Länder is the sum of its receipts per capita. These consists of: the Länder-share of joint taxes, the individual Länder-taxes and partially (64%) the tax revenues of their municipalities. It is assumed that the financial requirement per inhabitant is the same in all the Länder. The amount of transfers from a rich to a poor Land depends on the amount by which its financial capacity per (fictitious) inhabitant differs from the average. Therefore a linear-progressive skimming-off schedule is used. But there are some exceptions for the city-states and sparsely settled Länder. Their populations are hypothetical increased, because of the assumption of a higher financial requirement per inhabitant. At this point the distribution becomes very elusive, since special needs of certain Länder should be considered actually afterwards in stage 4. To complement the financial equalisation there are supplementary grants by the federal goverment for the poorest Länder. There are two different kinds: general grants and grants for special needs. General grants go to Länder whose financial capacity per inhabitant is still less than 99.5 % of average. The difference between the Länder is therefore considerably and clearly reduced. In result there should not be any tax competition between them at all. Grants for special needs (called “solidarity levy”) should compensate eastern Länder and are not tied to a specific purpose. Until 2019 they receive transfers amounting to around 105€ billion to build up the infrastructure, which is still comparatively underdeveloped as a result of the partitioning of Germany. Because the eastern Länder will lose this money after 2019 the discussion about the fairness of the current system is staring again. At present the regulation does not only eliminate competition among the Länder. Furthermore it enlarges the differences in financial capacity among the Länder by pushing poor Länder too far above the average (Figure 4). Therefore the federal government should not extend the solitary grants for eastern Germany. The first three stages of the financial distribution system are already more than sufficient. This article tries to take a critical look at the MDM scheme in India by considering some papers which quantify its achievements and shortcomings. The general layout of this article is: a short introduction of the MDM scheme, the achievements, the shortcomings and then finally the conclusion. Other benefits of the scheme include inculcation of hygienic habits (washing hands before and after eating), increased social interaction amongst students of different social strata (castes, class, religion etc.). One of the main motivation behind introducing this scheme was to give an incentive to parents to send their children to school, as the burden of providing lunch to children was transferred away from the parents and borne by the school. A number of studies have come up with positive findings about the MDM program. The most obvious and tangible benefit of the scheme has been the marked increase in the attendance and retention of girl children and children belonging to the SC/ST communities (historically disadvantaged communities in India) in schools. Studies conducted by a number of different and independent institutes and having as their sample, data from a number of Indian states and districts confirm this. For example, in a study conducted by Samaj Pragati Sahyog in the 70 most backward villages of Madhya Pradesh, it was found that there was a 15% increase in enrollment in schools after the implementation of MDM, and the number increased to 43% when only SC/ST enrollments were considered. Another study conducted in the same state (“Mid Day Meal Scheme in Madhya Pradesh – A study – 2007” by National Institute of Public Cooperation & Child Development, Indore) found that apart from increasing enrollment rates, it also reduced school drop-out rates, especially for girls. Teachers surveyed by this study reported that MDM had also aided in the active learning at school and thus increased the academic performance. Similarly, a study (“Cooked Mid-Day meal programme in West Bengal – A study of Birbhum district”. Professor Amartya Sen’s Pratichi Research Team 2005) shows that MDM has also reduced teacher absenteeism and narrowed social distances amongst school children (the act of eating together has special significance in the Indian context. Historically, only members of the same social caste could eat together). It goes without saying that it is quite difficult to measure the changes in parameters like enrollment, attendance, drop-out rates etc. that can be directly attributed to the introduction of MDM program. There can be other causes like an increased awareness amongst parents about the need to send children to school in a changing world etc. that can also be attributed the change. Also, many of the studies considered the opinion of teachers in measuring academic performance, and this can always be distorted by their own biases. There are also a fair number of studies which point out serious shortcomings in the MDM program. And which have a look at whether development funds released at the government level, actually reach the level of schools to be able to pay for the food items and cooking costs. A study conducted by the independent body ‘Centre for Policy research’ for tracking accountability came up with some interesting results for 4 districts in the states of Bihar and Uttar Pradesh. Only about 60% of the enrolled children received MDM per day. Food grain stocks in schools were much lower than needed to serve MDM in accordance with the norms. The release (quantum and timing) of food grains from higher levels of the administration is not adequate to meet school needs and points to a planning gap. There was a huge difference between the quantity of food grains allotted to the state and the quantity which was actually lifted by the state. Bihar lifted just 52% of the grains allocated for it, while Uttar Pradesh was better at 82%. Other studies found out that a lack of proper infrastructure for storing and cooking food grains led to wastage and spoilage of food grains. This also poses a serious health hazard to kids. It would be wise at this point to caution that the two states considered by this study are amongst the most backward in the country, and consistently rank very low in governance indicators. As such, one cannot draw country level generalizations based on this study. But it does go to show the status of MDM for about 30% of the school kids in the country (that’s the combined population of these two states). To conclude, a scheme should be judged not only by analyzing its achievements and shortcomings, but also by taking into account the costs (in this case the monetary costs to the government) of financing the scheme. The 2015 budget allocates Rupees. 9236.40 Crore (Eu. 1,231.5 Million) which at about 20 crore school children, comes to a sum of about Rupees 1.5 (Eu. 0.02) per student per meal. This goes to show that the scheme itself is a great and inexpensive way of improving both education and nutrition amongst school children in India. What needs to be done though, is for the states to ramp up their operational effectiveness in delivering the scheme to school kids. Back in 2011, the labour cost in Belgium was the highest of all European countries. It suffered a tax burden 36% higher than those of the average employee in the EU. In Belgium, employers must transfer an average of 2.34 euros per euro of employee labour. It was crystal clear that this situation wasn’t sustainable and the Belgian government needed to take measures. But at that moment, Belgium suffered from the largest political crisis in the country’s history. The world record for a country without an elected government is held by Belgium, which lasted 589 days starting in 2010. This was all because of the fact that the opposing language districts (Flemish & Walloons) were unable to agree on policy issues. In 2014, new elections were organised and a stable government was formed. This government consisted of Liberals & Social-Democrats. During the formation meetings, all the parties agreed on the need of a ‘Tax-Shift’. 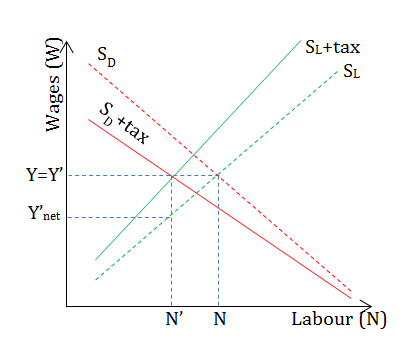 The ultimate goal of the ‘Tax-Shift’ was to lower labour cost while maintaining a decent level of tax income. Let’s have a look at the most prominent expedients in the ‘Tax-shift’. • Withholding tax raised from 25 to 27 percent. In present times, the ‘Tax-shift’ yields results. The labour cost per unit of output decreased in Belgium in the first three months of the year by 1.1 percent compared to the last three months of last year. This caused Belgium to have the highest reduction in all OECD countries. The decrease is a result of declining labour costs caused mostly by the tax shift and increased productivity in the first quarter. However, the biggest impact comes from the wage restraint. For the Federation of Enterprises in Belgium falling labour costs figures represent positive news. “It is a first step in the right direction to eliminate the wage handicap,” said chief economist Edward Roosen. “However, the road is still long,” said the chief economist, referring to the historical handicap of 15.5 percent. I share the same critical as Edward Roosen. Belgium still has a long way to go but is on the right track. If the government can maintain the same drive and spirit to guarantee lower labour costs, Belgium would be once again an attractive country to invest in as a multinational. If we keep this in mind, Belgian economy will flourish once more. This blog post was written by Laurens Maximus, student at Nova SBE. On the 23rd of July, after 4 days of discussions and just one day before the parliamentary recess, the Belgian government reached a deal on the much-awaited tax shift. From the trade unions to the government, everyone agrees on the fact that the taxes on labour in Belgium are too heavy. Belgium has indeed the highest tax wedge on labour in the OECD as shown on the graph below. With this tax shift, the goal of the government is to decrease the tax burden on labour, so that the competitiveness of Belgian companies could be improved and that new jobs could be created. This reduction on labour taxes will be compensated by raising taxes on other incomes. The tax shift should represent 7.2€ billion by 2018 but how will the Belgian businesses and individuals be affected by this tax reform ? According to the government, the tax shift will be beneficial for both the employers and the average working Belgian. The reform will reduce gradually the employers’ social security contribution from 33% to 25% which means that it will become cheaper to hire new people. Thanks to that, the wage burden will be reduced and the so-called wage handicap alongside. Belgian companies will therefore improve their competitiveness compared to the firms in the neighbouring countries. The tax shift is not only good news for the employers though. For once since the new government is in place, the workers could also benefit from the reform together with their employers. According to the numbers provided by the government, the low and middle income worker will welcome 100€ more per month after tax. Although this may look like a win-win situation, the increased taxes on other incomes as counterpart should not be forgotten. The agreement concluded end of July involves several new tax measures that will affect the average Belgian in their daily consumption. They may get 100€ more on their paycheck each month but these will likely serve to pay the tax increases on some goods. Some of these new measures are the following; the VAT on electricity will rise from 6% to 21% (the previous government had actually decreased it from 21% to 6% in 2014), the excise duties on alcohol, tobacco and diesel will go up, the withholding tax rate on dividends, interest and royalties will go through an increase from 25% to 27% and a “speculation tax” will be introduced for the investors that will sell shares on the stock market within six months. All these measures, and others that were not mentioned here, should be implemented by the end of 2016. A tax reform in Belgium had been awaited for some time and we must wait for the outcomes of the implementation to see whether it will be truly beneficial for the workers and if reducing the employers’ social security contributions will actually create more jobs. Nonetheless, this tax shift is already a first step forward, whatever the future effects. For Mr Vanden Houte, chief economist at ING Belgium, “the tax shift is less big than one could have expected” and “there is room for more agreements in the coming year”. In this blog post, I would like to present and discuss some issues regarding taxation of inheritance. Inheritance tax is a special tax imposed on gifts and inherited goods or property. Until January 1, 2014, Norway had an inheritance tax system, which was stipulated in the Inheritance Tax Act (Arveavgiftsloven) of 1964. The law defined how much to be paid to the state in the case of inheritance or significant gifts, and how the tax was to be calculated. In 2013, inheritance (or advancement of inheritance) and gifts from the same person with a value above NOK 470,000 (EUR 50,000) was taxable with a tax rate ranging from 6 to 15 per cent dependent on the total value and who was the recipient (lower for next of kin) (Skatteetaten, 2015). Total revenues to the Norwegian state from taxing inheritance were relatively low. In 2013, NOK 34 billion worth of inheritance and gifts was taxable and in the same year, the public revenues from inheritance tax amounted to NOK 1.9 billion, roughly EUR 20,000 (SSB, 2015). One of the main concerns of the state is the distribution of wealth in the society. An inheritance tax can be justified on the grounds of distributional concerns. Receiving inheritance implies that value is added to the recipient’s fortune. High-income, large-fortune persons tend to receive more inheritance and gifts, so by introducing an inheritance tax this group will generally pay more to the state and the tax could contribute to smoothen the societal wealth distribution. In addition to the distributional effect, the ability-to-pay principle of an inheritance tax is used to justify such a tax. The principle involves that taxes must be levied based on the taxpayer’s ability to pay the tax. In general, heritage tends to include very liquid assets. For example, cash or cash equivalents can be raised by inherited real estate, either from sale or rental. When a person receives greater wealth through inheritance, he will also have the ability to pay an inheritance tax. Like any other public tax, the inheritance tax would affect people’s decisions on for example how much to work, how much to spend on consumption and savings and investments. Soon after they took office, the Conservative coalition government in Norway decided on abolishing the Inheritance Tax Act in their first national budget. Affective as of January 2014, there is no longer an inheritance tax levied on the Norwegian people (Regjeringen, 2013). There is, however, still room for a reintroduction if a future government should decide to do so. Several arguments for abolishing the inheritance tax were put forward. Firstly, the inheritance tax was said to often affect people with low or normal income and many perceive it as unfair if they have to pay high fees for inheriting their childhood home or family holiday house. Secondly, it was argued that removing the inheritance tax would facilitate generational shifts in family businesses by easing the liquidity burden. Moreover, it was intended as a simplification measure reducing administration costs for the state and for taxpayers who no longer have to deal with the extensive and somewhat complicated inheritance tax legislation. The abolishment of the inheritance tax was not necessarily good news to all. Effectively, the system that took over introduced a tightening of the tax rules based on the so-called continuity principle, meaning that the recipient inherits his predecessor’s fiscal position. In practice, this implies that if you for example inherit an estate and sell it, you must pay a capital gain tax of 28% based on the market value of the property. Thus, you may actually end up paying far more in taxes than you would with the previous inheritance tax system. In the transfer of businesses, the continuity principle implies that the recipient must continue depreciation on the same basis as that of the deceased or donor. Should the recipient choose to sell; the appreciation in value of the business is taxable, while depreciation in value is tax deductible. Because of the difference in tax rates, the timing and who are subject to pay taxes, it is not so that the continuity principle offers a similar solution to the previous inheritance tax system. That would be a mere coincidence (Zimmer, 2015). Some of you have maybe read Thomas Piketty’s popular book “Capital in the Twentifirst Century”, or at least an excerpt (Piketty, 2014). The core message of the book is that capital owners are taking an increasing share of the pie and that the inequalities in society are further amplified by inheritance of wealth. One may agree or disagree with some of the analysis of Piketty, but the fact is that several key issues that he is concerned with corresponds well with similar findings by large organizations that are normally quite conservative in their analysis such as the IMF and the OECD. The OECD points to a general reduction in taxes on high income and wealth to explain the increasing income inequality. Since, in many countries, the richest are becoming increasingly richer while the real wages of the rest of the population remain largely unchanged, an international debate on distribution mechanism to curb growing inequality has been fuelled. So is economic inequality an issue in Norway? Looking at the share of top-income earners will only give us information on the concentration of income at the very high-end of the income distribution. It does not, however, provide any indication of the overall income inequality, i.e. the shape of the rest of the income distribution. Also, wealth tends to be more unevenly distributed than income (IMF, 2013). A commonly used measure of inequality is the Gini coefficient, which is measured on a scale from 0 to 1, dependent on whether the whole population has the same income or all income accrues to one person, respectively. There is not necessarily a relation between the share of top-income earners in a country and its Gini coefficient; for example, Norway and Portugal have a similar top percentile (pre-tax) income share, while the Gini coefficient (in 2012) is significantly higher in Portugal (0.536) than Norway (0.410) (OECD Stats, 2015). When the inheritance tax was abolished in 2014, the current Finance Minister in Norway pointed to the income inequality in Norway being among the lowest of the OECD countries, and that removing the inheritance tax would not change this. Although she is right in terms of the relatively low Gini coefficient, the trend in society that the very richest are taking up on an increasing share of the total national income led the OECD to recommend that Norway reintroduce the inheritance tax (OECD, 2014). The decision to abolish the inheritance tax in Norway must be seen in connection with the net wealth tax, transactional taxes on capital and property taxes, which are all instruments that can be used in order to level out income inequalities in society. In addition to obliterating the inheritance tax, the current Government are also very much in favour of reducing the net wealth taxes, looking to other countries where taxes on net wealth have been declining over the last 15 years. What should be noted, however, is that these ‘other countries’ also tend to have inheritance taxes or higher property taxes, or both. An IMF Fiscal Monitor report from 2013 also shows that in terms of total tax on wealth, Norway is already well below the OECD average (IMF, 2013). Taxing wealth transfers via estate, inheritance or gifts tend to raise relatively little in terms of public revenues and the distortionary costs are hard to evaluate because it can depend on the motive of the benefactor. Thus, although the inheritance tax amounted to relatively insignificant public tax revenues for the Norwegian state, it could be argued that it had some important functions with regards to the distribution of wealth in society. Limiting transmission of inequality between generations should also be the main appeal of an inheritance tax system. Another reason to tax inheritance is be that it may reduce the distortion of work effort in the recipient that inheritance may foster. In my opinion, the latter argument would be an interesting topic for further studies, in particular whether the abolishment of the inheritance tax gives certain groups of Norwegian youths with prospects of high inheritance, advancement of inheritance and gifts a false security, in a reality where young people need to understand the relation between hard work and wealth. Piketty, T. (2014). Capital in the Twenty-First Century. USA. Zimmer, F. (2015). Arveavgift ut, kontinuitetsprinsipp inn. Oslo: Universitetet i Oslo. Today Norway is one of a few countries which still use the wealth tax and the debate about keeping, changing or removing the tax are often reflected in the media and among politicians. In this post I will reflect upon the tax’ design and some of its socio-economic consequences. In 2015 wealth tax amounts to 0.85 percent of a person’s net wealth that exceeds 1,200,000 NOK (approximately 130953 Euros). Different assets are assigned different values for the purpose of net wealth tax. For instance, bank deposits, shares in listed companies, and debt are assigned full value, while assets such as real estate and shares in non-listed companies are assigned a lower value. From the figure we observe that the revenue from the wealth tax is relatively high in Norway compared to other countries. 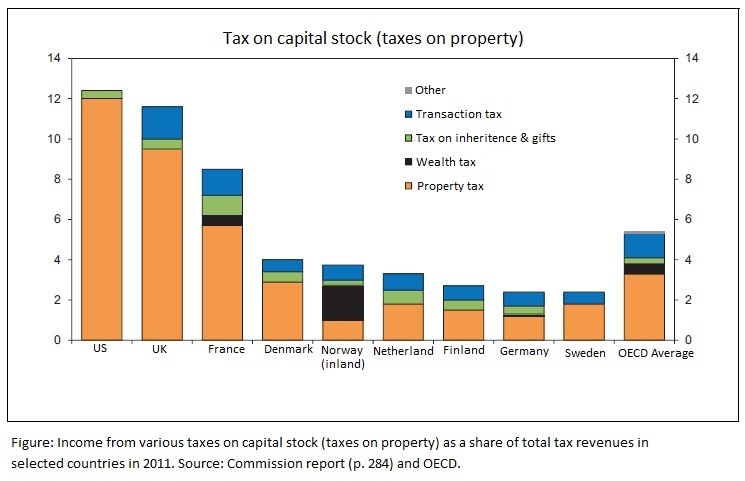 It also shows that neighbor countries have relatively higher taxes on property and inheritance than Norway. Note that in 2014 the Norwegian government eliminated tax on inheritance. In 2014 a Commission set down by the Government published a report reviewing corporate taxation in Norway. The Commission identified the design of the wealth tax as the main problem: The valuation of different wealth assets vary too much. A consequence of the unfavorable design is that Norwegians are motivated to change their savings towards assets that are assigned lower values or are exempted from net wealth tax, for instance towards real estate. It is often argued that commercial property and “working” capital should be exempted from the wealth tax. However, the Commission advises against this solution because it would reinforce the distorting features of today’s wealth tax. In general, those with the highest wealth have placed it in business activity, and therefore this solution would primarily impact those who have wealth in the form of bank deposit or real estate without debt. Hence, the exemptions would be an advantage for those who already own the most and the distributional effects of the wealth tax would be reduced. The Commission’s opinion is that the wealth tax contributes significantly to vertical equality, meaning that it causes persons with high income to pay higher taxes. While the tax’ contribution to horizontal equality, similar individuals should be taxed equally, is smaller due to the unequal distribution between different assets. The Commission advises against a removal of the tax. They’re conclusion is that that provided a more uniform valuation and a more moderate tax rate, a tax on net wealth can be justified in the interests of both efficiency and redistribution. In particular, they encourage a more consistent valuation of real estate, which is already treated favorable in the overall Norwegian tax system. In conclusion, my opinion is that the wealth tax is an important instrument for distribution policy and should therefore be kept. However, the Commission’ reports makes it clear that changes are necessary to ensure a higher degree of horizontal equality and to minimize the tax’ distortions. With rising household income and globalization, tourism sectors across the world have experienced high growth since the early 1990’s. Expenditures from international visitors to Portugal has increased on average 6.4% per year between 1995 and 2013, contributing approximately $16B to the Portuguese economy in 2013, with global tourism expenditures increasing by approximately 6.2% per year over the same period. Portugal is an attractive destination boasting lively cities with historic and cultural charm, warm Mediterranean climate and environmental advantages, and a unique cultural diversity all catering to a broad range of tourists. In an attempt to leverage the rising popularity of international travel to Lisbon, the municipal government has in recent years debated the introduction of a tourist tax for international visitors. Such a tax is no novelty with popular destinations including taxes on tourists overnight stays in Berlin and Barcelona, and even informal accommodation sharing sites such as Airbnb collecting and remitting overnight stay taxes to local governments in Paris and Amsterdam. In Lisbon, collection will take the form of a €1 tax on all international visitors arriving through the city port or international airport, with a further €1 tax per night on all tourist occupied beds for the first week of stay to be implemented next year. From an economic point of view, a tax on tourism is an attractive revenue generating scheme for local governments. Such taxes can be used as alternative means to finance operations, maintenance or investment in the tourism sector which must compete for public resources against other goals such as health and education. The Lisbon municipal government has earmarked such funds to be reinvested in to the upkeep of historic monuments in the city and the building of a new museum. Tourism taxes in a sense export some of the burden from local residents to visitors to the city, who are primarily non-voters in the country. This tax has not been met without controversy however with political parties asking for the tax to be revoked and fears that charging taxes on arrivals will make Lisbon less attractive and welcoming to tourists, decreasing its competitiveness among alternative European city destinations. Even recently, the tax on airport arrivals has been deemed illegal within the European Union on the basis of discriminating against non-Portuguese entering the country. In a move resembling to ease negative perceptions of this tax by locals and tourists alike the ANA Group, which manages the airport in Lisbon, has agreed to cover the head tax on arriving visitors without passing on these burdens to passengers (expected to reach €3.6 – €4.4M in revenue this year). All said however, the state of government expenditure in Lisbon (as of 2007) is well below competing European destinations and is expected to decline. Paired with increasing visitors to the city and many new hotels opening, a tourism tax remains a viable avenue to mitigate some of the expenditure burden from the tourism and travel sector. The key is to balance tax fees with tourism services and amenities to maintain Lisbon as a competitive tourist destination. The Trump case – is immigration killing the US? In November 2016, the United States of America will vote to elect their 58th president. Campaigning has already began, and even though Republicans and Democrats have not yet chosen their candidate, Donald Trump appears to be the forerunner for the GOP nomination, while Hillary Clinton and Bernie Sanders battle for the Democrats’ preference. One of the focal points of discussion and main sources of division is the country’s immigration policy – While Obama has been working to streamline it and allow for easier integration and legalization for those willing to work and has his party’s backing, Trump argues for an aggressive containment and deportation policy to ensure the interests of Americans. Trump’s argument rests quite significantly on a public finance topic – tax cost of the immigrants. Trump states, as a main pillar of his thinking, that “Any immigration plan must improve jobs, wages and security for all Americans.” . While he does not oppose immigration, he is intent on ensuring it only happens in a way that benefits Americans – something that he claims is not currently the case and requires measures opposite to the ones argued for by Democrats. Following Obama’s executive action on immigration, undocumented workers will be able to claim tax refunds for work performed illegally . This is strictly against what Donald Trump stands for, adding to the already very high alleged costs in tax credit to illegal workers . He is in favour of eliminating tax benefits for illegal work, and more generally of making sure immigrants who are admitted to the country do not come to live off the state – “Applicants for entry to the United States should be required to certify that they can pay for their own housing, healthcare and other needs before coming to the U.S.” . A great part of the immigrants currently in the US live in poverty or just above it, as can be seen in figure 1, and stress the welfare state (though it is light in the US, it is not non-existent, as Medicaid will cover at least emergency services even for illegals  – check exhibit 2). Current American immigration policy is highly redistributive. The typical immigrants are poorly educated and receive benefits substantially in excess of the taxes they pay. Does the increase in GDP they bring about compensate for their costs? The pie increases, but so does the amount of people who feed off of it. Differing opinions on the total effect of this is what creates the Republican/Democrat divide. Picking sides is a tricky subject – Trump coming across as brazen but determined to uphold American interests, and Obama and his potential Democrat successors promoting a more sensible image, though possibly lacking in strength. With a year to go before the elections still, this will be far from the last we hear on the matter – The rest of the world, directly affected by this issue, listens intently. The great number of asylum-seekers: Burden or opportunity ? This article emphasizes the German difficulty in receiving such number of refugees in a short time. The German system is not prepared for that: the asylum process takes 5 months instead of 3, there is not enough accommodation for refugees and some of them have to sleep outside in tents while, everyday, they are hundreds (mothers with babies included) to wait in front of the Office for Health and Social Care. Facing this situation, the government is adapting his social system and looking for a solution which could be to share this reception with all the countries of the EU. It leads us to wonder: is this arrival of migrants a burden for the European countries social system ? Let’s try to answer the question and bring the effects on public finance out. This crisis is hard to manage and it can be seen like a weight. The lack of infrastructures implies government’s expenditures. As regards economic migrants, the countries from the EU have spent more than 11.3 billion euros since 2000 (2) in order to send them back to their country of origin. Expenditures to receive asylum-seekers also are important and the budget for 2015 amount to 480.5 million dollars. (3) All of these expenditures are not really well perceived because they are funded by taxes paid by the ratepayers. This crisis is all the more complicated since it does not concern all the European countries on the same way. The reception centres of the first countries of arrivals, like Italy and Greece for instance, are gridlocked and it also the case for Germany while other countries part of the EU are not receiving people. As it is obvious that following Dublin Regulation is not possible, A.Merkel proposed to redistribute migrants in all the other countries of the EU by quotas. These quotas would enable each country to receive migrants in a best way and with dignity. It also gives rise to analyse the advantages of these migration. Indeed, in the medium term, welcoming refugees does not have a negative impact on public finance because this population use to pay more taxes than others while they receive less social aids. (4) This table from The economist shows how there is not impact on pubic finances. In my opinion, long-term benefits are higher than short-term expenditures. Moreover, I think the EU needs them to boost consumption, public investments… in a word, the economy. After World War II migrants enabled Europe to ride out the crisis it was facing, maybe today’s refugees will make us know again what prosperity is. Basic income: a substitute for welfare state? Swiss residents will vote in 2016 on a proposal for a basic income of 2,500 Swiss francs ($2,700) per month. The basic income would be a government payment to all citizens without considering their income and situation. This unconditional payment could be an appropriate substitute for welfare state, which faces criticisms. Welfare state’s opponents indeed argue that this system implies negative effects. Means-tested welfare programs require much bureaucracy as these benefits have to be defined based on households’ income and situation. The welfare state can also have an impact on family composition and lead to a free-riding effect: social benefits may discourage people from working. Criticisms against the welfare state have multiplied in relation to the economic crisis, as it can be viewed as a burden on public budget. Did the welfare state become unsustainable and should it be replaced? Swiss government seems to consider this idea. Welfare state has also been reformed in the United Kingdom and a new welfare benefit replacing means-tested benefits and tax credits has been implemented. Reforming welfare state seems to be a current issue. Basic income would solve some issues of welfare state: as basic income does not depend on people situation, it would reduce intrusive and costly bureaucracy and would not influence family formation. Besides, it could also tackle the disincentive to work: regular flow of benefits would not be interrupted because of administrative delays when working situation changes and people would be able to look for work without fearing uncertainty. However, we have to consider the affordability of the basic income. Using a formula computed by James Tobin, Nobel laureate in Economics, The Economist tried to assess the increase in taxes required to fund basic income. They concluded that eradicating poverty using this system would trigger a 60% additional income tax for everyone, which is “basically unaffordable”. However, large savings resulting from the replacement of most of welfare benefits and tax reliefs were not taken into account. According to The Huffington Post, the additional income tax would amount to 18% approximately for everyone, which is far much lower than The Economist estimation. If we consider that such increase could be offset by the basic income, this system is not unaffordable. However, studies carried out in Europe and in the United States show that costs of universal basic income would be lower if this basic income is combined with comprehensive and means-tested payments. Moreover, replacing the whole welfare state by basic income would have significant impact on income distribution and we can fear that living conditions of needy people would be worsened under such system. To conclude, basic income would provide incontestable advantages but may not be a substitute for welfare state as a whole. To ensure a fair, optimized and affordable social safety net, basic income should be combined with a few targeted and means-tested welfare benefits, which would still enable to reduce bureaucracy. The Danish “kontanthjælp” – what determines the size? In 2014, 3 billion euros of public funds was spent on the Danish social security transfer “kontanthjælp” to help secure 167.357 Danish citizens’ incomes! The transfer is a public unemployment benefit for citizens who are not able to provide for themselves or their families and it is one of the pillars of the Danish welfare model, which aims at making sure that no one is being completely lost on the ground. Even though most Danes agree in the existence of the transfer, the size of it and public resources spent is often being brought up for question. Especially in the light of the last fiscal crisis it was discussed if the transfer rates should be cut. The arguments in favour of the transfers are that there should always be a security for everyone to be able to attain their most basic needs. Thus the purpose of “kontanthjælp” is to be a last resort to help you onto your feet again from whatever knocked you down no matter what background you come from. This also calls for transfers that are not too low. One of the main arguments against the transfer is that it might not give incentive to work if it becomes too high. That some people will actively choose to be on benefits since it gives them the same enjoyment as being employed, which calls for transfers that are not too large. According to different studies there might be an effect on labour supply of lowering the size of the transfer on the short sight but it is not very great and almost fades out in the long run. This was among others found in a report from SFI (2005), i.e. a study from before the high unemployment rates. One of SFI’s explanations for the small effect was that a big share of the people on “kontanthjælp” has other issues than just the financial situation that prevents them for being ready for the job market. The issues can be of physical, psychological and social character or be the lack of qualifications or competences. Thus only changing their economic situation does not necessarily make them more work ready. So what should decide the right size this transfer? If the objective is to decrease the public expenditure, by lowering the transfer it will actually be achieved, since some people will be given the economic incentive to get a job thus not receiving the transfer and the ones who will still be on the transfer will be given less. If the intend instead is to decrease the number of people on the transfer with a great amount the research does not work in favour of that being achieved only by lowering the transfer. In the last case you will have to look at the number of people actually getting off the transfer against how much you value that the people who won’t be more job ready will end up having a lower income. Legislative elections in Portugal are just around the corner and a heated debate has been held on the sustainability of the public pension system. One of the most controversial proposals, put forward by the coalition Portugal à Frente (PàF), concerns the horizontal capping of the Social Security, in which above a certain threshold contributors may opt not to discount for the public pension system, thereby having the possibility to discount for mutual or private funds. Considering that currently the public pension program is a defined benefit system, financed on a pay-as-you-go (PAYG) bases, is that proposal the adequate response to a pension system that is under financial distress? Feldstein and Liebman, two of the authors that more intensely preconize a shift towards an investment-based system, argue that one of the main drawbacks of the PAYG system is that the taxes imposed on labour income distort the labour market, as the implicit PAYG rate of return is usually lower than the marginal product of capital, and so contributors see those income taxes as “actual” taxes. Thus, the authors state that the primary reason to move to private pension systems “is that the rate of return on incremental savings [would permit] future benefits to be financed with a lower rate of contribution during working years, eventually permitting a higher standard of living for both workers and retirees”. Moreover, the economy must be growing, in order to finance the transition between schemes. Especial caution should be devoted, in my view, to this last condition: for the shift to a mixed system to occur the Portuguese state would eventually have to issue more debt, which does not appear to be a good alternative in a country with a public debt of 129% GDP and an estimated anaemic 1,7% GDP growth in 2015. Halfway between public and private pension systems, there is the possibility to implement mixed programs. These, supposedly, have the advantage of decreasing the degree to which the retirement income levels are subject to financial market volatility of a pure investment based system as well as to demographic and political threats of a PAYG system. Also, Feldstein and Liebman argue that the PAYG part of the program could be used to attain the politically desired redistribution. In my view, this is a very misleading argument: if only incomes below the established threshold contribute for the public part of the pension system, the margin of the government to carry redistributive policies would be severely hampered. Interestingly, several of the arguments pro-privatization are considered, by other economists, to lack significant theoretical and empirical support. For instance, Stiglitz and Orszag state that any potential increase on the rate of return will be eroded by the higher administrative costs of the individual accounts, contradicting Feldstein’s main argument to adopt private systems. In this light, Orszag estimated that, several fees and costs absorb around 45% of the value of an individual account for an ordinary worker in UK. It is clear that this is a topic for which no consensual answer exists. I believe that instead of abandoning the current pension system, we should commit to improve it by widening policies that increase the birth rate, in order to mitigate the consequences of an ageing population, as well as promote sound economic growth and to impose a tax on the added value of big companies, to account for the shift from labour-intensive to capital-intensive methods of production and value creation. The Portuguese public social security system contemplates two distinct arrangements: one designed for private sector workers and public sector employees registered since January 2006 (the general regime of social security subsystem) and another one for public sector employees who have started working to the public sector until 2005 (the Caixa Geral de Aposentações subsystem). For simplicity, I refer to the overall public pension system as Social Security. Norwegian real estate tax – who does it benefit? The capital tax in Norway was reduced in 2014. This tax is for the ones that have capital above a given level. This led to a decrease in the income for government and municipal, an income loss that needs to be recovered from other areas. The reduction of capital tax was given under the argument that the capital tax is preventing necessary investments in the Norwegian industry. So, is real estate tax a better then the capital tax? Well, as a result of the benefits of owning property a lot of investors have made big money with buying, letting out or/and selling property. A side effect from this is the increasing prices for properties, and in particular in Oslo. This again makes it harder for “normal” people to buy their first home. So, an increase of the costs for owning a property may be helpful to prevent the huge increases in property prices, since it is no longer that attractive for pure investing. On the other hand – is the cost big enough to give an effect for the big investors, or do the real estate tax only hurt the ones that already are vulnerable to an increase in expenses? In my opinion – the answer is both yes and no. I am afraid that the real estate tax may hurt the ones more sensitive to an increasing costs compared to the capital cost, in a way that makes it harder for them to make an investment in living. At the same time it can be an important tax due to preventing the increasing property prices in Norway, which makes it harder for young people to enter the housing market.